I made sign for a restaurant and finished it with an outdoor polyurethane and now it’s bubbling up very badly! It was hung outside their establishment and I don’t know if the sun hitting the sign caused it to bubble or what. I had trouble with it drying properly before giving it to them from the wet cold weather we had. I used an outdoor poly on it. Can this be salvaged? Also, what is a good finish for future reference for outdoor wood pieces? Poly is not a good outdoor finish. Get something from a marine supplier. Avoid Helmsman spar varnish at all costs. are you a sign maker by trade or a hobbyist ? what kind of wood is it ?? it looks like construction lumber from the Box Store. 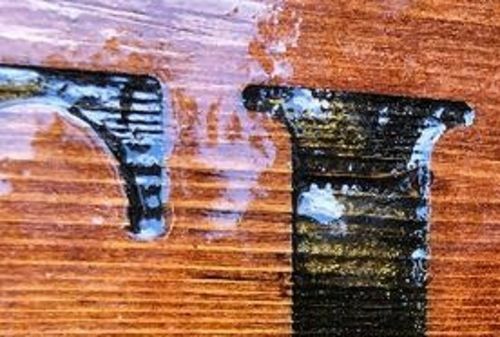 this appears to be out-gassing of trapped moisture in the wood. did you also seal the back of the wood ? Like Bondo said – poly is not for outside use. more info needed about the entire process in order to provide an accurate fix. also a photo of the entire sign will be of some help. Bondo nailed it…urethane finishes are never good in the outdoors. As for salvaging it, you now have the urethane finish on it…and it will always be a problem. I suspect removal of what’s there (not what you wanted to hear) is the only solution. yes, this appears to be a sandblasted sign. IME; wrong material and wrong finish for any outdoor project. website forums for sign makers that are run by sign makers. another one with all the correct elements: wood, primer, finish, hardware, etc. and to accurately answer your question: Can this be salvaged? no – it can not. I make laser cut and engraved signs. I’ve never done anything requiring a finish quite like this. So the letters are engraved and backfilled, then it was stained and the outdoor poly was used for the final finish. I’m concerned I won’t be able to sand this all the way back down especially since the letters are recessed. If I do sand it back down, I’m going to try to lightly hand sand the recessed letters and use the marine outdoor finish. I’m sick to my stomach about it because this sign took 3 hrs to engrave on each side. Get a can of gel paint stripper and follow the instructions. Use a toothbrush on the letters and brush the whole thing with mineral spirit. Wipe it down, let it dry and sand if needed (it will need it). My view is not so draconian as the others, strip it and refinish. Personally I would use a breathable oil finish designed for outdoors (the popularity of decks has caused them to proliferate). into the new with CNC and Laser engravers. using the correct finishes can keep you out of the pain and misery section. a recipe for disaster right from the git-go. redwood, mahogany, teak, loqust, cedar, cypress, to name a few. yes, they cost more than utility grade pine. you get what you pay for. also – most clear finishes are not designed for the “one time & forget it” projects. hard to read from a distance with dark colored paint. While it may be easier and more efficient use of time to just make a new sign. Salvaging that sign is definitely possible. You could probably use heat gun and remove that poly, or planer or sander to remove raised portion. 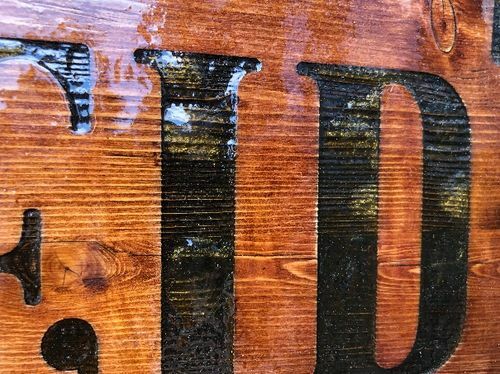 I agree using an outdoor wood is ideal, I’ve seen many a signs built out of pine, basswood, elm, plywood, all of which last with proper finish and or ability to dry. Normally I’d say to just rebuild it but it was done for a paying customer who needs a sign outside of their establishment. From a customer service aspect I think you’d want to tell them you will make another sign for them ASAP and apologize profusely. Their customers might not notice the bubbles but they will comment on a missing sign which will only further irritate the owner. Then use the knowledge gained from this thread and get to work on an even better sign for them. I’ve been hand carving, router cutting and sandblasting commercial wood signs for 40 years. I use vertical grain redwood for sandblasting, Cypress for hand carving and router cutting. I seal the redwood to keep it from bleeding thru the paint and use only acrylic latex semi glass paint and primer with nothing on top of it. The only thing I seal is gold leaf, other than the redwood. Never had a failure and the paint usually holds up real good for about 10 years. As mentioned by other posters, find a sign makers forum if you plan on doing this as a business. Youtube may have some good videos also. Good news! I have a friend that sanded it all the way back down to the natural wood which looks perfect. So tomorrow I am engraving it then will use a sand and seal on it then a marine varnish to seal it. I think I’ve learned a lesson on this one. and – what kind of wood are you using. 6 to 8 coats to be effective against the UV which breaks down the finish. Minwax sanding sealer is not a good foundation for marine spar varnish. every couple of years, it needs to be lightly sanded and a coat of varnish applied.